Display the Rental Property tab. Click the Properties & Tenants button and choose Add Tenant. 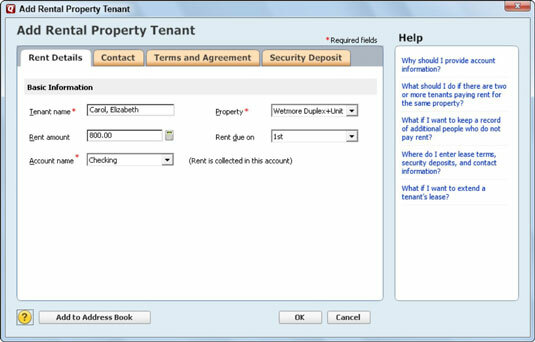 Quicken displays the Add Rental Property Tenant dialog box. The Property & Tenants button also displays another tenant-related command, Show Tenants List. Choose the Show Tenants List command to display a window that lists the previously added tenants. You can edit and delete tenants that appear in the list by clicking the tenant and clicking either the Edit or Delete button. Describe the tenant by clicking the Rent Details tab and then entering the renter’s name in the Tenant Name text box and the monthly rent in the Rent Amount text box. Select the bank account name into which you’ll deposit rent in the Account Name drop-down list box and the property (or property and unit) the tenant occupies in the Property drop-down list box. You can specify the rent due date using the Rent Due On drop-down list box. Optionally, you can use the Contact tab of the Add Rental Property Tenant window to collect and store contact information for the tenant, including work phone number, home phone number, e-mail, and so on. (Optional) Document the lease agreement. You can use the Terms And Agreement tab to document the rental agreement, recording items such as the lease term, lease start date, late fee, and so forth. You can use the Security Deposit tab to record the security deposit you collect at the start of the lease and any security deposit you return at the end of the lease. Quicken displays the Rental Property tab, or window. The tenant or tenants you’ve added appear indented below the rental property they occupy.